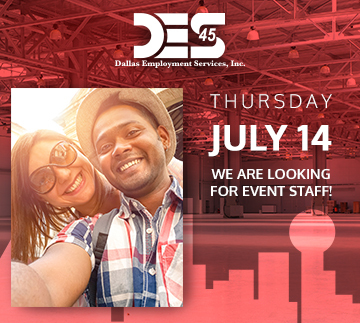 DES is seeking several Contract Customer Service / Event Staff for our client hosting a wholesale fashion event in Downtown Dallas on Thursday, July 14th. Our client is a well-established wholesale event company and is seeking Customer Service / Event Staff to ensure all guests receive exceptional service and attention, and promote an overall positive experience. This is a fantastic opportunity for someone able to work a flexible schedule and with customer service and cashier experience to work a fun and exciting wholesale event with a dynamic team in the fashion industry, and earn some extra CA$H!!! The event hours on Thursday, July 14th are 9am – 7pm with 4 – 10 hour shifts. Smile and greet all customers promptly. Answer customer question; providing product and pricing information. Liaise with event staff and management to resolve guest concerns. Assist customers; recommending and locating products and sizes. Answer all customer calls promptly and with a smile to initiate a positive guest experience. Remain upbeat and friendly to ensure customers know they are important and appreciated. Support the event team through a variety of tasks and projects to make it a fun and exciting event, including; running the photo booth. 1 year of customer service and cashier experience. Show enthusiasm and support for the company, culture and team. Strong passion for customer service and solid cash handling skills. Able to work well under pressure in a fast paced environment and exercise sound judgment and discretion. Able to identify opportunities for improvement and assume responsibility. Excel in a team environment. Must be self-confident, self-motivated, and professional. DES, Inc. is an equal opportunity third party and does not discriminate against candidates on the basis of race, gender, disability, veteran status or other protected characteristics. If you require application assistance, please call our office at 214-954-0700.